Anyway... less than two weeks ago the bike wouldn't start after a friend helped me adjust the pre-load. the battery voltage was too low so we had to jumpstart it. I blamed it on the fact that we had the ignition on for too long, so didn't really pay much attention to it. On Sunday, I came back from a 5-day trip to Germany, and yesterday I took the bike out for a short ride. When I tried to start it again after less than an hour, it didn't want to start and I had to call BMW assistance to jumpstart it again. Then again, I had the same thing happen on my previous s1000r (but not as soon as now). It sounds like your battery is faulty or the bike is not charging the battery properly while you are riding it. I would take it back to the dealer for a warranty repair or replacement battery. Check generator output voltage across RPM range. Perform a load test on the battery - it could have a weak cell. Also, check current draw when bike is "off". Make sure there are no unusual parasitic draws. If it is under warranty, let the shop figure it out. I had an issue where the alternator was not generating enough power to run and charge, replaced under warranty. I'm not sure how thorough your dealer is, so just be careful as they may choose a path of least resistance (read lazy) and change your battery and call it a day. 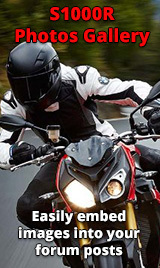 If they do change the battery only, measure voltage at home on battery terminals as the motorcycle is running, it should read at least 13.7 Volts. OEM batteries do fail. This is the confusing part, people say the battery is new so it has to be okay. I would never consider buying one when the warranty ran out. Too expensive also. If a battery is fully depleted it sometimes fail (cells fail), and it takes damage every time. I read a battery test on car batteries, and after 3 complete discharges, there was only 40-60% capacity left in the batteries (depending on manufacturer). So you really don't want that to happen. The assistance tech might be right in his assumptions, hard to say without knowing your use, but if you do frequent starts and short rides the bike won't be able to charge the battery on those short rides. Maybe you need a battery charger to keep it topped up, just a thought. Noggie is correct, it really helps to keep a smart charger on hand and just plug the bike in after each ride. I keep one rotating between three bikes, two days each. BMW bikes use a lot of battery power just sitting. The 9 amp hour battery is small and it is easy to discharge. Three or four times and it is toast. Set up a pigtail direct to the battery for your charger, 15 amp fuse and it is usefull. Keep in mind the 2017 bikes have a 407 watt alternator, the previous models only 350 watts and that is not much. The bike uses about 200 just to run. I'm guessing both problems could be related. Apparently it's a known ignition switch problem. Taking it in for its 10.000km service tomorrow and to have a look at this as well of course. 2016 S1000R here. It goes to the dealer once a year for service. Last year they said the battery failed and replaced it under warranty as a favor since they were sure it was one of the extra circuits I wired into the bike. Mind you there was no measurable drain on the battery when off and I use a battery tender if the bike has been sitting for more than a week. This year I get the same news, battery failed test. This time it takes some convincing to get a new battery under warranty. Still no parasitic draw. Still tell me it is my extra circuits. I have a relay for a set of LED driving lights and and two Battery tender leads (one for heated gear) wired to the battery, open circuits. I have a tank bag wired to the acc circuit, no load with the key off. And, I still use the battery tender if I havent been riding the bike. I love my bike and I hate that i am thinking of selling it because of this. Every day should end with a smile.